Aloha! We are so happy you want to skydive, and we are ready to take the leap with you. 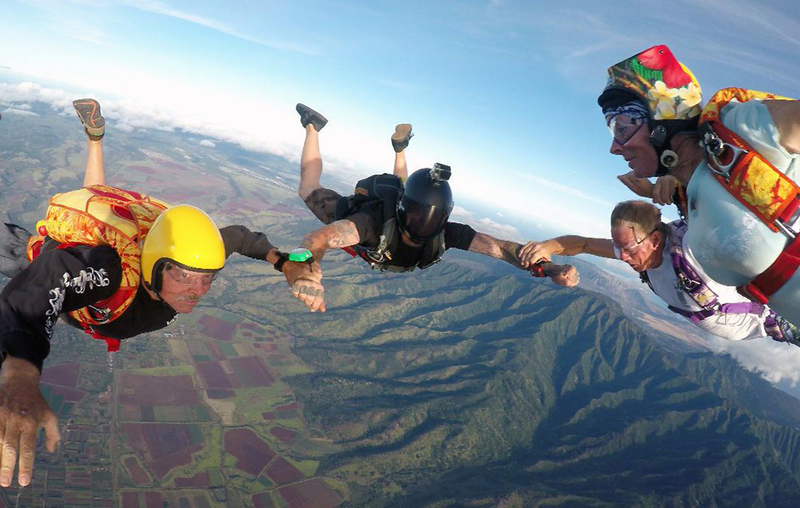 Whether you are booking your first skydive or an experienced skydiver looking for fun jumps, Oahu Parachute Center is the place for you. 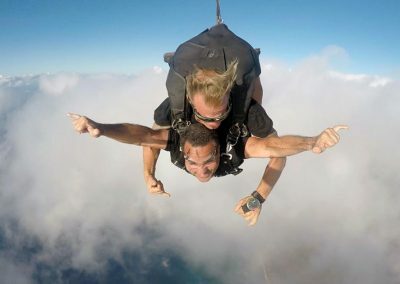 We are proud to offer the “fastest skydive” on Oahu with little to no wait times! Enjoy a quick ride to altitude in our King Air 90, the fastest skydiving plane in Hawaii! Leap into freefall knowing safety is our number one priority and all our equipment and gear is closely monitored by a FAA Master Parachute Rigger with over 30 years of experience. If you’re looking to make your first skydive, you have come to the right place! Imagine the thrill of jumping from the aircraft and accelerating to up to speeds of 120 mph! With just about a minute of freefall, you will experience a rush of adrenaline that may take your breath away. Just relax! Soon you’ll be soaring under a massive canopy as you decelerate to enjoy a 4–5 minute canopy ride on the pristine North Shore, Oahu. Tandem Skydiving is the quickest and safest way to enjoy your first skydiving experience. After your first tandem, you may decide to enroll in our Accelerated Freefall Program to become a licensed skydiver. Display price is per person for a 10,000 ft tandem skydive. You may also book a 14,000 ft skydive for $200 per person. The 14,000 ft package is highly recommended as it provides 26 additional seconds of free fall, additional time to soak up the views, and the time you need to find your comfort in the sky! Sneakers or laced up shoes are required. Long pants are recommended. Please dress comfortably. Cancellations within 72 hours will be subject to a $50 penalty. A tip for your tandem instructor and camera operator (if applicable) is appreciated. Hotel Pickup from all Waikiki Hotels for 9:00 am, 10:00 am & 4:00 pm jumps only.